Founded by sisters Eunice and Sabrina Moyle in 2003, Hello!Lucky has become internationally renowned for their playful designs and vibrant palettes. Keen to know more about the wacky minds behind the brand, we sit down and talk all things creative! Hey guys! Obviously Hello!Lucky is a hella cool name for a hella cool company! How did the brand form and what sparked the name of “Hello!Lucky”? Well, we grew up in Asia in the 1980’s in the heyday of Hello Kitty and nonsensical products bearing English slogans like “Hello, Posh Boy!” When it came time to pick our own brand name, we wanted to recall the joie de vivre and absurdity of our misspent youth. Plus, the domain name was available. To be honest, “Hello, Posh Boy!” sounds amazing. With such an array of original designs, what keeps the inspiration flowing?! Is there anything that inspires the team outside of the studio? Our love of design and punnery! We are creative fire hydrants seeking to snuff out snits! We have no patience for peevishness. Life is to be celebrated. There is no burden that can’t be lightened by an anthropomorphized food item, old-fashioned human connection, and a good pun. Outside of the studio and our unhealthy Pinterest / Instagram addiction, our children inspire us most. They keep us grounded in what is really, truly ridiculously funny, and they’ve even been known to come up with a good idea or two (cough, future interns!). 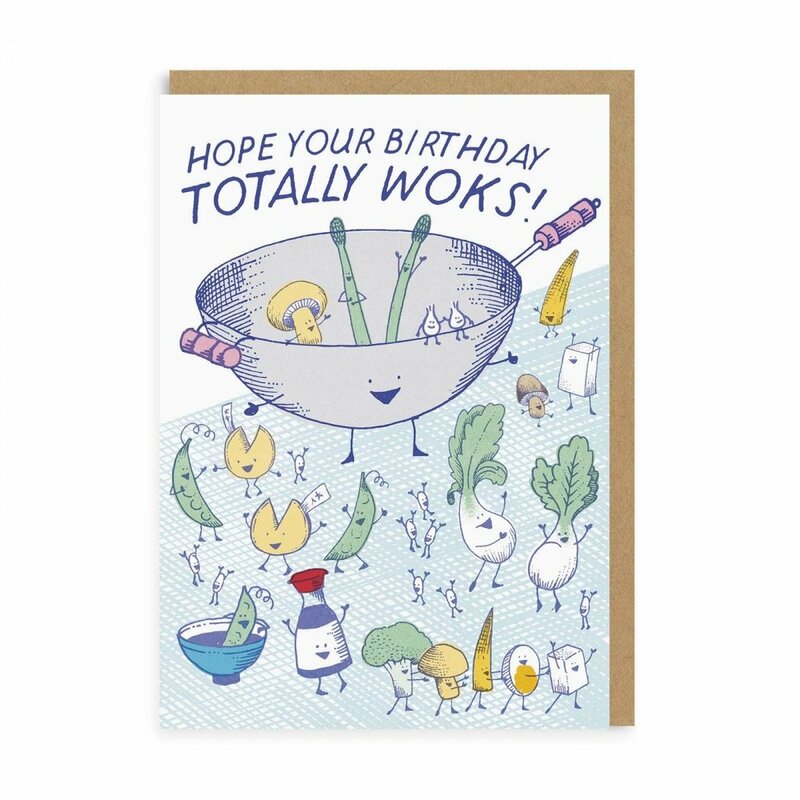 Adding to our previous question…the pun game is incredibly strong when it comes to your greeting cards - how do you keep thinking up fantastic phrases?! We just love word play! Humor is all about contrast and surprise. Puns are funny because they bring the unexpected, but at the same time they’re so painfully predictable. Hence, the groan factor that helps puns pack that funny-not-funny one-two-punch. Our puns are often inspired by images that pop into our heads from the ether. For example, we’ll think of a huge neon T-rex with tiny hands and wonder, what could we add that would make it even punnier, ahem, funnier? Oops, Freudian slip! The answer is usually a pun. In this case, it might be “Happy Birthday! You’re not extinct yet!” or in the case of a protest poster, “Save us from extinction!” Once you start thinking in puns, the pun never ends! It’s just good clean pun. So can we talk about neons please?! (Our favourite is Pantone 805 U!) Hello!Lucky’s signature is bright and punchy. What is the go-to neon from the Hello! team? Um, of course! We are children of the 80s. Splatter paint and jelly bracelets make our hearts sing. In our humble opinion, everything is brighter and therefore better in neon and our favorite is 912 U. Eunice also happens to be a complete Francophile, and is obsessed with French palettes, which invariably include a hint of neon (and, presently, pale pinks and mustard yellows!). We can’t get enough of it! That said; watch out for our newest obsession with holographic foil! It brings to mind unicorns and magic, two of our other key obsessions, as evidenced in our forthcoming children’s book. Over on the ol’ Instagram it’s obvious that you guys are highly passionate about women having their voices heard! Can you tell us more about the events and workshops you guys hold surrounding the topics of feminism, and women’s rights! Yes, we are super passionate about women, particularly young women, taking on leadership roles and showing how to make the world a more just, equitable, and peaceful place. We are so passionate that we wrote a book! It’s called Be the Change: The Future is in Your Hands, and it inspires teens and tweens to use their creativity to be a positive force in their communities, and the world. We just about fell off our chairs when Kirkus, a notoriously critical trade publisher, called it “an inspirational coach…Kids will close this book energized and empowered…” And then we freaked out when we were asked to talk about it on the Pantsuit Nation podcast (a secret Facebook group of 3M+ members created after a certain promising female candidate lost the 2016 presidential election!). We got started in civic action with the Write_On Campaign, co-founded with our partner Egg Press in 2014, which invites people to connect authentically offline during April, National Letter-writing Month. The campaign is still going strong, with our annual Write_On challenge to write 30 letters in 30 days having just happened this April! Next, we created a get-out-the-vote campaign for the 2016 presidential election called The Future is in Your Hands, and then made protest posters for the 2017 Women’s March which were downloaded 5,000 times and used worldwide. Our cause pins have raised over $20K for the ACLU and Planned Parenthood. We’ve held hosted poster-making parties for the Women’s March and will be making posters for the National School Walkout at our book launch event, as well as participating in the March for Our Lives. We’ve also just partnered with WalkWoke, a new protest poster making app, to make customizable version of our protest poster graphics available. We are collaborating with I am That Girl, a non-profit that empowers high school and college age women, on a social change curriculum. A portion of proceeds from Be the Change benefit WE.org, an amazing charity which makes doing good doable and inspires youth to change the world. We could keep going on, but you should just read the book! Thanks so much Eunice and Sabrina! Don't forget to sign up to the incredible Hello!Lucky Papergang box this May! For £10.95 you can get a box full of stationery goodness delivered to your door! Absolute steal mate. Follow Hello!Lucky on Instagram @helloluckycards and on Twitter @helloluckycards. Want some sneak peeks into their May Papergang box? Follow @thepapergang on Instagram for updates!